Take the hassle out of finding a park or stressing about the traffic – use Waikato Regional Council’s FREE Park and Ride services. Five routes will run between key Hamilton locations and the University of Waikato for the Night Glow on Saturday 23 March, 2019. This year we’re delighted to bring you buses from The Base, and Hamilton East as well as all the usual locations. More buses will be running on the routes, so plan ahead and let us do the driving. FREE buses will run between 4.15pm and 7.00pm from the Park and Ride sites and special event bus stops along the routes. After the Night Glow has finished, buses will run on a continuous as-available basis until all passengers have boarded for their return journey. For those of you visiting from Auckland and north of Hamilton, the best Park and Ride site for you is our northern most park situated at The Base. It’s easy to find and easy to get back on the road to Auckland. If rain postpones the Balloons over Waikato until Sunday 24 March 2019 there will be park and ride services available on that day instead. 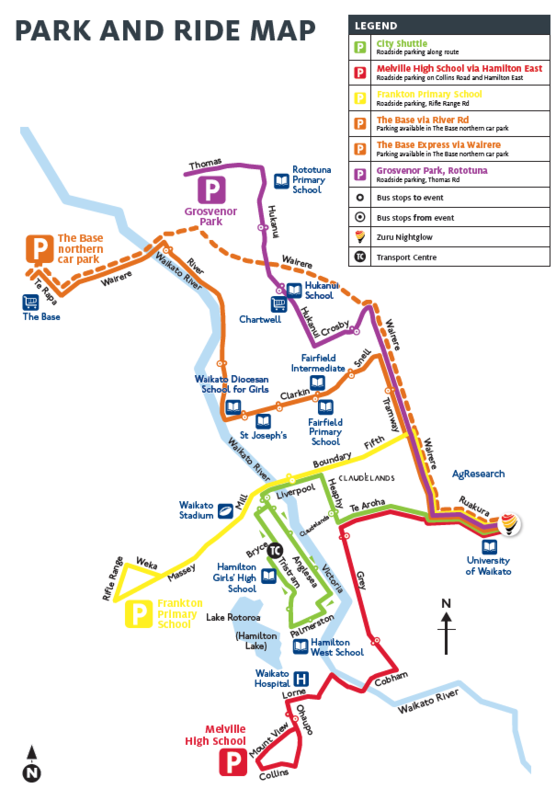 Park and ride sites and bus stops. Take away the parking hassles, reduce congestion and travel with us.